Toybank sets up a new Toy Library at Salaam Baalak Trust in Charni Road. The Salaam Baalak Trust (SBT) centre at Charni Road caters to about a 127 lesser-privileged children. Toybankers took brand new board games to the SBT Centre at Charni Rd. yesterday afternoon. The children were playing outside, and a few of them noticed we were from Toybank. They saw us bringing in cartons of toys, and came running in with excitement to see what toys we have got for them! 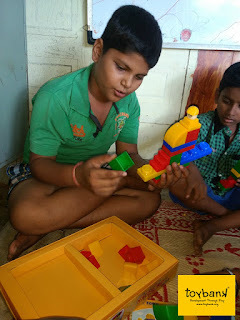 Once the children had a quick glance at few games and were sent back home by the teachers we started the teacher training session and went through all the games. The Toybankers taught the teachers how to play all the games. The teachers were very happy with the games, and were sure that their children will outsmart them in playing these intelligent board games. The Toy Library will run in full swing from the first week of May! 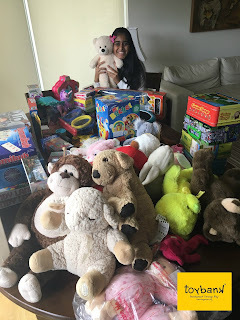 Thank you to Aditya Birla World Academy for funding us to buy brand new toys for our new Toy Library! Toybankers will be visiting the SBT Toy Library regularly, every month. Do contact us if you wish to visit our Toy Library at Salaam Baalak during the play sessions. Happy hours with the kids at FSC!